A new breed of car takes to the stage. Singapore. BMW Asia and Performance Motors today launched the first-ever BMW X2, a car that is more than just a new BMW X model. With its unmistakable design and sporty, urban genes, it makes a confident impression both in its class and within the BMW X model family. The digital services from BMW ConnectedDrive and BMW ConnectedDrive Services – both of which are now available in freshly updated form – add further intensity to the overall first-ever BMW X2 experience. The bold, uncompromising nature of the first-ever BMW X2 is evident at first sight. This vehicle stands out from the crowd in any setting. Even next to its bigger brothers, the BMW X4 and X6, the first-ever BMW X2 makes a wholly distinctive impression. The main contributing factor here is the car’s exterior design, which essentially combines the fast-moving body language and low-slung proportions of a coupe with the robust construction of a BMW X model. Above all, it is the first-ever BMW X2’s proportions which create its expressive, dynamic demeanour. It is shorter and more than seven centimetres lower than the BMW X1 yet has the same wheelbase. Featuring short overhangs, it also has a stretched, coupe-style roofline and slim window graphic. Many of the design details emphasise the first-ever BMW X2’s standalone nature while simultaneously and unequivocally signalling its membership of the X family. The time-honoured BMW kidney grille is just one example, turning the familiar trapezoidal shape on its head and instead widening from top to bottom. This is the first time this design detail has seen the light of day on a modern BMW. Another striking detail more typical of a BMW coupe is the placement of the brand logo on the C-pillars. This is another element that underscores the sporting aspirations of the first-ever BMW X2. EXTERIOR DESIGN HIGHLIGHTS: FRONT END. The kidney grille has always been an identifying feature of a BMW. On the first-ever BMW X2, however, its outline is wider at its base than at its top. The first-ever BMW X2 is the first modern BMW to feature this design cue, and it gives the new car a broader, even more distinctive and even sportier appearance. Below the grille, the hexagonal surface treatment in the bumper further reinforces this impression. The kidney grille provides a visual expression of the first-ever BMW X2’s classy appeal. The fronts to the grille bars in High-gloss Black contrast with the grille’s chrome surround. The design of the first-ever BMW X2’s headlights reinforces its striking, sporty looks. Familiar twin circular elements (including LED daytime driving lights) combine with the foglamps to create the characteristic six-eyed face of the X family and make the vehicle instantly recognisable. Because the inner headlights are slightly narrower than the outer ones, the first-ever BMW X2 assumes a tangible air of concentration and dynamism. Moreover, shiny chrome surfaces add a high-quality touch while a chrome bar at the outer edges enhances the impression of width. Full-LED headlights come as standard on the first-ever BMW X2. The bi-LED light for low beam and high beam is extremely bright and effective at illuminating the road, while also accentuating the first-ever BMW X2’s sporty looks particularly impressively. The headlights display fine detailing, achieved in part through hexagonal LED daytime driving light tubes and laser engraving. The C-pillars host two characteristic BMW features: the hallmark BMW Hofmeister kink and, for the first time on a BMW X model, the BMW roundel. There is something special about the design of both these items. As an integral element of the C-pillar, the Hofmeister kink on the first-ever BMW X2 is slightly elongated and does not cross over the door line. This boosts the sporty looks of this Sports Activity Coupe. The BMW roundel on the C-pillars invokes a design cue much admired on classic BMW coupes such as the 2000 CS and 3.0 CSL, and ensures the car is instantly recognisable on the road. The roofline of the first-ever BMW X2 has an almost coupe-like lightness, which gives the whole car the impression of surging forward like an athlete. A key contributor here is the styling above the familiar BMW swage line, where the body tapers in sharply towards the glasshouse. These athletic shoulders generate a large number of light surfaces in the upper section of the first-ever BMW X2 makes the glasshouse appear lighter. The extremely slim window graphic teams up with the M rear spoiler to inject extra dynamism into the car’s proportions. EXTERIOR DESIGN HIGHLIGHTS: REAR END. The horizontal design lines of the first-ever BMW X2’s rear end tighten the visual distance between the car and the road, emphasising the car’s width and therefore its sporty character. These lines continue into the high-set rear lights. The LED rear lights represent a symbiosis of the T-shape lighting contour shared by other BMW X models and the L shape familiar from BMW coupes. This iconographic light signature includes a precise LED strip on the inside the rear light units. The first-ever BMW X2 is therefore clearly recognisable, even in the dark. The first-ever BMW X2 has a broad, planted stance on the road, especially when viewed from the rear. Creating this impression of width are the horizontal design lines and distinctive rear bumper. One of the ways the first-ever BMW X2 expresses the inherent power of its BMW TwinPower Turbo engines is through the design of the tailpipes. All four-cylinder engine variants come with 90mm twin tailpipes. Contemporary ambience with premium flair. The interior of the first-ever BMW X2 blends signature BMW elements, such as a pronounced driver focus and dynamic lines, with the understated ruggedness of a BMW X model. The high-class quality of the first-ever BMW X2 and its impressive level of equipment, are both instantly apparent. The instrument panel has contrast stitching and decorative stitching as standard, while the centre console features materials including Sensatec with contrast stitching. The first-ever BMW X2 deftly combines all of this with a generous helping of everyday practicality. The boot has a capacity of 470 litres, meaning it can effortlessly handle leisure activities, from shopping sprees to a skiing weekend or mountain-bike tour. This high level of functionality manifests itself in the passenger compartment too, thanks to features such as a door design featuring large pockets and stowage bins lower down. Driver focus. The cabin of the first-ever BMW X2 is focused on the driver, with the design of features such as the instrument panel binnacle clearly directed at the road ahead. All controls are ergonomically positioned to allow the driver to assimilate their information with a single glance and operate them with supreme ease. This all helps to transform the driver’s seat into an exclusive driving environment where the sportiness that the first-ever BMW X2 oozes through every inch of a journey can be experienced with special intensity. 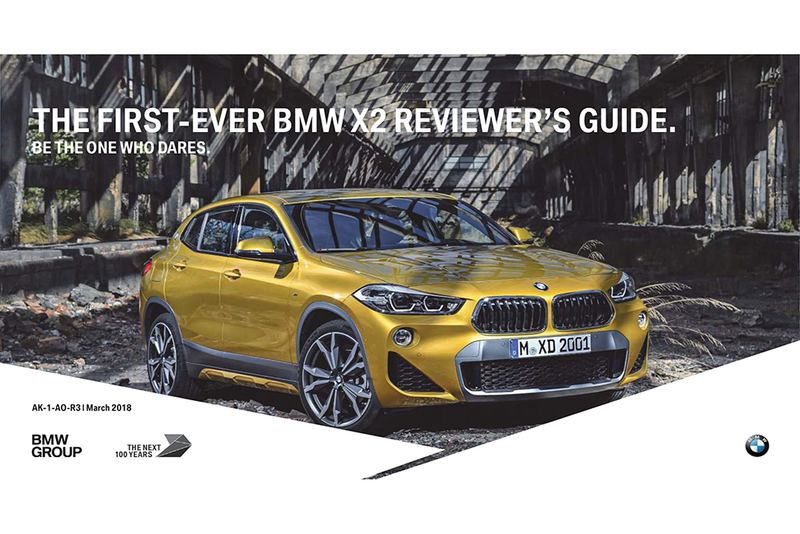 The first-ever BMW X2 makes quality something its owners can experience. The softly foamed instrument panel is pleasant to the touch, gains further visual appeal with contrast stitching and decorative stitching. The choice of trim finishers, including the new Aluminium Hexagon Anthracite variant, further underlines the high-quality credentials of the first-ever BMW X2. All functional controls in the centre console are set in high-gloss black fascias as standard, giving the interior a special touch of timeless elegance. The lighting package allows drivers to set a stylish lighting mood for the interior of their first-ever BMW X2 by choosing from the colours Orange, Lilac, Mint, Bronze, Blue and White. The LED lighting in the trim surfaces of the instrument panel and door panels forms a continuous band that extends all the way around the cabin to the rear. The way in which the monitor and control consoles seem to be almost floating above and in front of the instrument panel is a particularly stunning effect of the night-time look. The modern black panel technology included in every first-ever BMW X2 as standard is one of its standout features. Employed for both the instrument cluster and the information display, it highlights the vehicle’s high level of technical sophistication. The panoramic roof found on the list of optional extras further adds to the sense of spaciousness inside the first-ever BMW X2 and bathes the passenger compartment in light. The front section of the panoramic roof tilts and slides open, just like a conventional sunroof. Driving pleasure on all types of road. First-ever BMW X2 drivers think differently, they break with conventions and they lead the way. So the first-ever BMW X2 really is the perfect car for them. The Sports Activity Coupe cuts a dashing figure on every journey, not least thanks to its peerless BMW TwinPower Turbo engines and sophisticated powertrain. These components team up with the car’s refined chassis to endow it with class-beating handling qualities, exceptional agility and superb feedback, thereby allowing the first-ever BMW X2 to generate levels of driving pleasure unprecedented in this segment. The common denominator of all first-ever BMW X2 models is a further improved chassis that transfers the immense agility and dynamism of the BMW engines to the road, thus providing an excellent basis for a thrilling driving experience. The car’s driving responses can be adapted with a simple push of the Driving Experience Control switch, which allows drivers to choose between default COMFORT mode, efficiency-enhancing ECO PRO mode and SPORT mode. The pre-programmed set-up available via SPORT mode gives the car even more dynamic steering and powertrain responses. If the optional Adaptive Suspension (incl. 10 mm lower ride height) is specified, the car’s suspension can be adjusted even more precisely to individual tastes and requirements. Drivers can choose between two settings – COMFORT or SPORT – using the Driving Experience Control switch. The result is sporty suspension offering solid roadholding and reassuring comfort over any surface. First though, the newcomer will be launched with a choice of the first-ever BMW X2 sDrive20i petrol model. It is equipped with the sporty seven-speed Steptronic dual-clutch transmission, which stands out with both its swift gear changes and highly efficient operation, making it another factor in the low CO2 figure. The 192 hp 2.0-litre four-cylinder unit delivers remarkable performance figures, too. The sprint from 0 to 100 km/h is over in a rapid 7.7 seconds and top speed is 227 km/h. Page 7 of 13. The intelligently connected, clever way to travel. As far as BMW is concerned, there is one thing that always comes first in a connected vehicle: the task of driving. For this reason, all of the BMW ConnectedDrive and BMW Connected elements in the first-ever BMW X2 have once again been designed to assist, inform or entertain the driver at the appropriate time using just the right services. Intuitive interaction between driver and vehicle forms the basis for top-class connectivity. The first-ever BMW X2 offers its driver three different ways of interacting with their car, as the sixth generation of the iDrive control concept now supplements the familiar iDrive Controller and voice control with touchscreen operation for the Control Display. The touchscreen can also be used comfortably by the front passenger. Standard specification for every first-ever BMW X2 includes a 6.5-inch Touch Control Display with navigation. This is can be upgraded to the optional 8.8-inch Touch Control Display with navigation. The display concept is designed to provide the driver with a quick summary of the most important information at any particular time by means of, for example, the tiles that appear in the display’s main menu. For even greater safety and convenience in the first-ever BMW X2, there is the option of the full-colour BMW Head-Up Display, which projects all important driving information and navigation/assistance system readouts onto the windscreen and therefore into the driver’s field of view – in high resolution. The integration of BMW Connected and BMW ConnectedDrive Services focuses on the needs of the first-ever BMW X2 driver. These digital services and comfort-enhancing functions enable first-ever BMW X2 drivers to organise their daily routines as efficiently as possible, both inside and outside the car – and, in so doing, allow them more time to enjoy life. BMW Connected+ provides a digital bridge between smartphones and the car. It delivers the next level of in-car personalisation and smartphone content integration on the Control Display of the first-ever BMW X2. This makes display and operation in the vehicle simpler than ever. One example of a new Connected+ service is Share Live Trip Status, which makes the question “What’s your ETA” a thing of the past; the driver can share their current location and time of arrival with business partners, friends or family. Not only does the first-ever BMW X2 offer drivers a wide selection of driver assistance systems, it also boasts highly advanced technologies. The standard Park Distance Control and the rear-view camera, whose images are transferred onto the Control Display, make precise and comfortable manoeuvring that much easier. The likewise Parking Assistant also helps the driver to find and make use of parallel parking spaces. The camera-based assistance systems available for the first-ever BMW X2 help to ensure greater assurance and safety in different driving situations. The optional Driving Assistant includes Lane Departure Warning, Speed Limit Info with No Passing Info display, High Beam Assistant, Collision Warning and Pedestrian Warning with City Braking function. In addition to these functions, the optional Driving Assistant Plus line-up also features the Active Cruise Control system with Stop & Go function – which maintains both a desired speed between 30 and 140 km/h entered by the driver and the safety distance to vehicles travelling ahead – and the Traffic Jam Assistant. At speeds up to 60 km/h, this optional function takes over both proximity control and lane-keeping tasks from the driver. The optional Traffic Jam Assistant uses steering assistance to keep the car reliably in the middle of its lane, but the driver needs to have at least one hand on the steering wheel for the system to work. The first-ever BMW X2: powerful and agile. The first-ever BMW X2 has an invigoratingly fresh feel to it. It immediately stands out as a BMW X model, yet it has a highly distinctive appearance, too. This is partly down to its different proportions, the execution of many of its details, the placement of the BMW roundel and the reinterpretation of a BMW design icon – the kidney grille. Plus, the black strip of cladding encircling the body produces the characteristically robust X model look, while lending visual emphasis to the ground clearance. Not only does the launch of the first-ever BMW X2 add a new member to the BMW X family, the new M Sport X model is also making its debut. On the road, the first-ever BMW X2 has the poise of an athlete in peak condition. This is even more so for the M Sport X model. The BMW X2 M Sport X combines design elements from BMW M and the BMW X family. The design of the first-ever BMW X2 M Sport X brings the vehicle’s sporty X character to the fore. Taking its cue from the add-on parts, decals and paint finishes in complementary colours familiar from rally cars, prominent use is made of the colour Frozen Grey to produce an overall picture of striking contrasts. This shade is used for features such as the specific M Sport X elements, which are visible from virtually every angle. Further standout features of the M Sport X model include the extremely dynamic bumper styling and a twin arrangement of tailpipes that are 90 mm in diameter. The first-ever BMW X2 M Sport X gets a bespoke diffusor insert in the contrast colour Frozen Grey. The new rear bumper and tailgate design sees the latter sitting flush with the rear apron. And that gives the rear end a supremely harmonious feel. The side skirts of the first-ever BMW X2 are among its signature features and contribute in no small part to its rugged and assured good looks. The first-ever BMW X2 M Sport X has specially designed cladding inserts in Frozen Grey. When viewed from the side, this lighter colour shade generates an impression of higher ground clearance and ensures this model stands apart clearly from its stablemates. The M Sport suspension fitted as standard on the first-ever BMW X2 M Sport X is a particularly good match for this model and includes tauter spring and damper tuning. With the M Sport suspension, the car is also lowered by 10 mm for even sportier roadholding. The optional Adaptive Suspension which uses dynamic dampers to variably adjust damper response behaviour, further enhances the driving dynamics. FIRST-EVER BMW X2 M SPORT X EQUIPMENT OPTION HIGHLIGHTS. Eight exterior colours are available as an option, including the Galvanic Gold metallic finish, against which the wraparound signature shade Frozen Grey produces a stunning visual contrast. This gives added impact to the character of the first-ever BMW X2 M Sport X. The first-ever BMW X2 has a poised on-road stance thanks to large wheels and a striking wheel rim design. The 19-inch style 722 M wheels fitted on the first-ever BMW X2 M Sport X as standard are exclusive to this X2 model variant. The optionally available 20-inch wheels in style 717 M really grab the attention – not just with their size, but their extravagant design, too. Available with the M Sport X model, the sportier M rear spoiler provides a dynamic flourish to round off the first-ever BMW X2’s roofline. As well as emphasising the car’s sportiness, it also underscores the narrow look of the rear window area. Together with the width-enhancing rear bumper, this creates an extremely powerful rear view. With its Micro Hexagon fabric/Alcantara Anthracite combination with M piping and contrast stitching in blue or yellow, the first-ever BMW X2 M Sport X accentuates the model’s superb quality and sporting ambience. Numerous upholstery options are available, including the newly available perforated Dakota leather in Magma Red, allow first-ever BMW X2 drivers to customise the interior as they please. The new Aluminium Hexagon Anthracite trim finisher with an accent strip in Pearl-effect Chrome can be specified for the first-ever BMW X2 M Sport X. Its design mirrors the hexagonal structure that is also a characteristic feature of the first-ever BMW X2’s exterior styling. Five further trim finishers are optionally available and all include an accent strip that matches the specific trim finisher, as well as contour lighting in the door trim. The first-ever BMW X2 is now available for viewing at the Performance Motors showroom. 1. The first-ever BMW X2 price. 2. The first-ever BMW X2 specifications. PML has achieved various accolades in the area of sales achievement and service excellence in its 39-year history in the luxury segment. 2002 - In an industry first, PML initiated a customer lifestyle and rewards programme which evolved into the ‘BMW 7 Series Privileges Programme Plus’ – a distinctive lifestyle and rewards programme that is exclusively available to owners of new BMW 7 Series in Singapore. Exclusive premium experiences covering golfing, driver training, chauffeur services and lifestyle have been specially designed with the discerning taste of the BMW 7 Series customers in mind. 2006, 2007– PML claimed market leadership among premium car brands in Singapore for three consecutive years. The flagship BMW 7 Series limousines used to transport world leaders during the 2006 World Bank meetings and all key government events was once again reaffirmed as the choice for leaders as the official car for various high-profile events such as Barclays Singapore Open, the ASEAN Ministerial Meetings and the Singapore Airshow. 2010 – PML broke the 4,000 unit sales record and set a new milestone in its retail history with a remarkable achievement of being the Top Luxury Car Brand in Singapore. PML reopened its refurbished Aftersales facility in East Coast Centre (ECC) at 280 Kampong Arang Road. 2017 –PML continued to trailblaze and achieved yet another sterling record of high performance in a second consecutive year. The introduction of five new BMW iPerformance models and an updated BMW i model saw PML cementing its position as the industry leader for plug-in hybrid electric vehicles (PHEVs) and electric vehicles (EVs) in Singapore. BMW was appointed the official car brand for numerous prestigious and high profile events including ASEAN Tourism Forum 2017, SMBC Singapore Open 2017, Singapore Yacht Show 2017, IMDEX Asia 2017, Miss Universe Singapore 2017 and Singapore International Energy Week 2017.